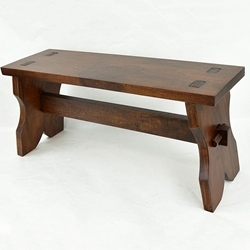 This Medieval Bench is crafted from stout hardwood components and finished with a dark wood stain. It consists of a bench seat, two legs, a leg support with two wooden pegs to secure the legs to the support. It is shipped unassembled. Please Note that the pieces can fit together in a functional, but loose way. Additional work may be required for a tighter fit. This medieval bench will make a great addition to your medieval decor or medieval camp.